Nothing in the games industry is sacred. Favorite games come packaged with DLC and season passes, franchises waver over time and developers lose their unique appeal. But that being said, there is something revered about the games we played as children, more specifically, the games children played in the 90s. Rare was a developer at the forefront of that hallowed time, defining a genre with the groundbreaking Banjo-Kazooie. And while the game has reached an almost divine status, Rare failed to capture this level of success again as the consoles rolled on. Playtonic was born from the memory of that triumph. Made up of veteran developers from Rare, the studio promised to create a game inspired by Banjo-Kazooie – possibly even to surpass it. After an exciting Kickstarter campaign, in June 2015 the project raised £2,090,104 in crowdfunding with 73,206 backers which meant surpassing the previous record (held by Elite: Dangerous) for the highest-funded UK videogame in the history of Kickstarter. Such was the thirst for another great, old-school platform game. This was how Yooka-Laylee was born. It is a format anyone with a passing knowledge of Banjo can recognize: two adorable animals explore a colorful world in partnership. They leap, flap and roll their way across multiple environments, unlocking new abilities and novel places to explore. 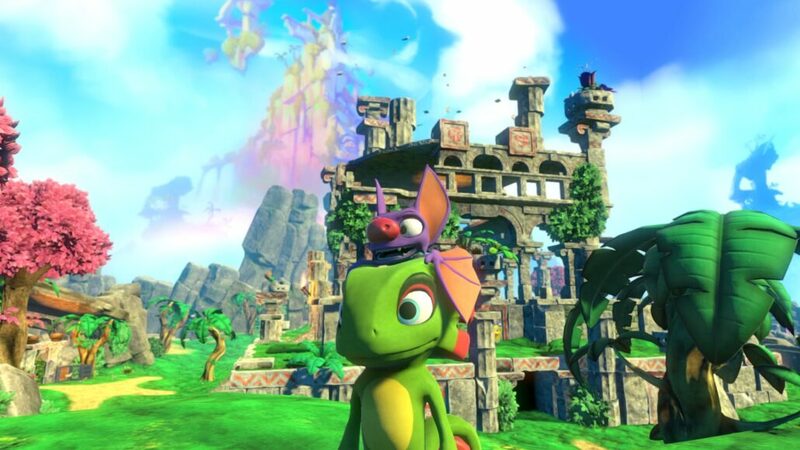 While the original couple was a bear and a bird, Yooka-Laylee is a lizard and bat respectively. It is at, its heart, unashamedly childish. From the color palette, which is best described as ‘bright’ to the dialogue, gameplay and intangible feel of the game, everything is family friendly in the best possible way. But it’s more than just a child’s game, it’s a game from our childhoods. I’m incredibly aware that lots of people, lots of readers, didn’t have the hand to eye coordination to play it on a Nintendo 64 when it was first released; for those that were, this is a new game created in an era gone by. Platforming is simple, with a world that, however beautiful, makes little coherent sense. Platforms rise out of bottomless pits that encircle the game world or hover unapologetically. Yooka-Laylee is not a game built upon lore, but upon fun. Playtonic had a clear goal when creating this game, to harken back to games of old, an exercise in fundamental fun and an attempt to revive one of the most consecrated gaming icons. In this aspect, they have undoubtedly succeeded. The game is a beautiful expression of pure, old school gameplay, with an atmosphere of peaceful, vibrant wonder. 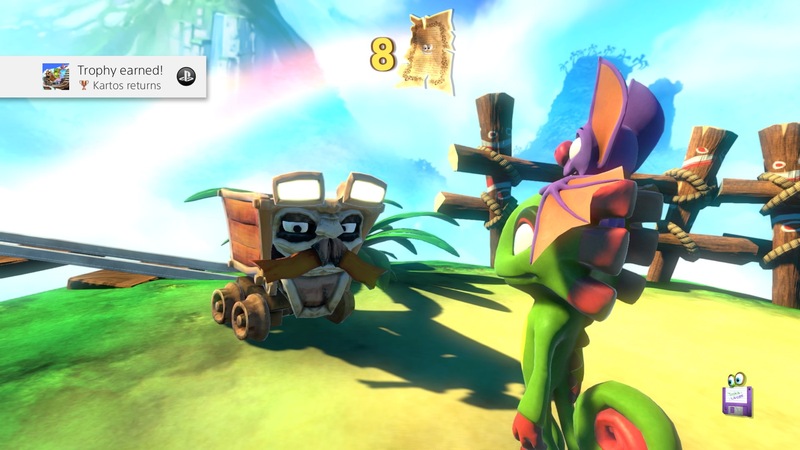 Its graphics are a joy for everyone to see, mostly thanks to the artists at Playtonic who were able to perfectly capture that unique style Rare fans are so fond of. Technically there are some frame rate drops on PlayStation 4, but nothing that ends up hampering the experience. Considering that there are no dedicated enhancements for PS4 Pro, the best way to witness this lovely world is by playing at native 4K and “Fantastic” settings on PC. The lack of any advanced graphics options is disappointing, but what’s most important after earlier videos had worried fans is that Yooka-Laylee ran perfectly smooth with an i7 6700K CPU and GTX 1080 GPU. Where the game does stumble a bit in its aesthetic is the sound design. Although there is an air of nostalgia that rings out amongst the dialogue and music, it is drowned out but the sheer obnoxiousness of it all. Characters speak in babbles, which although cute, quickly become irritating loops as sentences run on and burrow into your mind. And while the music on paper is a lovely rendition classical game music revitalized, in practice it is loud, ill-defined and unpleasant. In the end, anyone but children (whose ears are often satisfied with any noise) will be turning the sound down. But this is a game made primarily for children and the gameplay reflects this. You will spend most of your time exploring a variety of worlds, clambering across platforming sections to collect the games quills and pagies, and other treasures. But however precisely the game wants you to maneuver between pitfalls and obstacles, the controls are fiddly and vague. Sometimes you might find yourself doubling back to collect the quills that you missed the first time, not because they were hard to collect, but because Yooka decided to swerve around them instead. And this carries on into the abilities you begin to unlock as well. From rolling to spitting elemental attacks, everything just feels a little too haphazard as you desperately try to remain in control. It’s hard to say whether this takes away from the game in a meaningful sense. It’s not like Yooka-Laylee is designed as a tough-as-nails experience, so failure isn’t particularly punished. For the most part, children will hardly notice the floaty nature of the controls and as most people won’t be attempting to collect the hundreds of trinkets dotted around each map, it’s difficult to claim that it truly hampers your experience playing it. But the mild frustration you feel, that little inkling at the pit of your stomach when you miss a quill or slip off a high-rise platform is palpable. And it is most noticeable during boss encounters. An early game boss, whose logs roll towards you, is almost impossible to defeat smoothly as it takes a lot of practice to control the rolling necessary to avoid the obstacles. It’s annoying, but holding it against the game would be superfluous. Yooka-Laylee isn’t Dark Souls, you don’t need extreme precision and both the satisfaction from triumph and punishment in defeat are much more reduced. Whether it’s the sound or the controls, Yooka-Laylee is not the perfect game many of us hoped it would be. Although you get a great adventure with some beautifully rendered environments, funny characters and memorable moments scattered throughout, something doesn’t quite live up to the expectation we’ve been living since the consecrated days of Banjo-Kazooie. But there is more to this game than the sum of its parts. 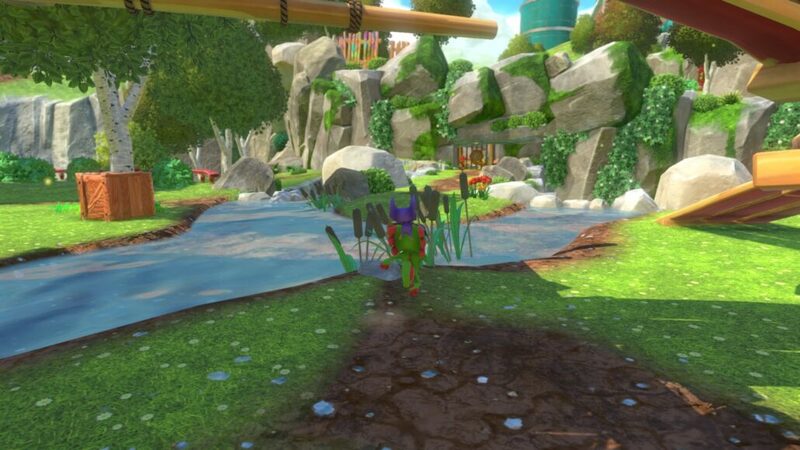 Whether it was the original intention that the game was developed for or the fantastic worlds to explore, there is something in Yooka-Laylee that brings you back, a simple, indescribable joy. It keeps you coming back and exploring each level one more time, both before and after you expand it. With hushed volume and an easy-going attitude, there is a hint of the old magic that enraptured so many gamers all those years ago. Reviewed on PlayStation 4 (code provided by the publisher) and tested on PC for performance. You can buy the game for PlayStation 4 or for Xbox One via Amazon. It might not be as good as your vague memories of the hallowed games of Rare, but Yooka-Laylee has a little bit of that old lovable magic in it. It may be made for children, but there is a little something that can make the old and miserable smile again. That alone is worth it.